The Breeders' Cup World Championships is an annual series of Grade I Thoroughbred horse races, operated by Breeders' Cup Limited, a company formed in 1982. From its inception in 1984 through 2006, it was a single-day event; starting in 2007, it expanded to two days. All sites have been in the United States, except in 1996, when the races were at the Woodbine Racetrack in Canada. With the addition of three races for 2008, a total of $25.5 million was awarded over the two days, up from $23 million in 2007. With the subsequent removal of two races, the purses for the remaining thirteen races totaled $24.5 million in 2014, plus awards for foal and stallion nominators. Prior to the 2016 running, the total purses were raised from $26 million to $28 million. The purse of the Classic was raised from $5 million to $6 million, and the purse of the Longines Turf was increased from $3 million to $4 million. In 2018, total prizes and awards were increased to over $30 million after another race, the Juvenile Turf Sprint, was added and the purse for the Sprint was increased to $2 million. Each Breeders' Cup race presents four Breeders' Cup trophies to the connections of the winner and a garland of flowers draped over the withers of the winning horse. Many Breeders' Cup winners will go on to win the Eclipse Award in their respective division. For example, of the eleven flat racehorse categories, seven of the Eclipse winners in 2015 had also won a Breeders' Cup race, while three others were in the money. In the 2015 listing of the International Federation of Horseracing Authorities (IFHA), three Breeders' Cup races are ranked among the top Grade 1 races in the world: the Classic (4th), the Turf (10th) and the Mile (12th). The Distaff is ranked second among the top Grade 1 races for fillies and mares. The event was created as a year-end championship for North American Thoroughbred racing, and also attracts top horses from other parts of the world, especially Europe. The idea for the Breeders' Cup was proposed at the 1982 awards luncheon for the Kentucky Derby Festival by pet food heir John R. Gaines (1928–2005), a leading Thoroughbred owner and breeder who wanted to clean up the sport's image. The Cup was initially faced with much skepticism in the racing community, however with the vocal support of legendary trainer John Nerud and others, the Breeders' Cup was carried out, and subsequently experienced tremendous popularity domestically and abroad. The prize money is largely supported by nomination fees paid by breeders for stallions and the resultant foals. In North America, participating stud farms pay an annual nomination fee for a given stallions that is equal to the stallion's advertised stud fee, plus an additional amount if the stallion has more than 50 foals in a given year. The cost to nominate a European stallion is 50% of their stud fee, while the nomination fee for a South American stallion is 25% of their stud fee. In North America, the breeders of the resultant foals must also pay a one-time nomination fee (currently $400) by October 15 of the year of birth. The races are operated by Breeders' Cup Limited, a company formed in 1982. The first event was in 1984. From its inception in 1984 through 2006, it was a single-day event; starting in 2007, it expanded to two days. All sites have been in the United States, except in 1996, when the races were at the Woodbine Racetrack in Canada. In 2006 Greg Avioli began serving as interim President and CEO of the Breeders' Cup, and he became the official CEO in April 2007. "This is an exciting time for the Breeders' Cup," said Avioli. "We will continue to focus on growing the international market for our championships, creating a successful two-day event and promoting the Breeders' Cup brand with both our television and sponsorship partners." In 2007, the event was expanded from one to two days and in 2008, the first day was devoted to female horses and the overall purse increased to over $25 million, making it what the New York Post called "the richest turf festival in the world." Before the Breeders' Cup expanded to two days, it was generally considered to be the richest day in sports. Beginning in 2008, the second day of the Breeders' Cup became the second-richest. In 2008, a total of $17 million was awarded on that day, down from $20 million in 2007 (two races were moved from Day 2 to Day 1). The richest single day in sports is now another Thoroughbred racing event, Dubai World Cup Night. It features six races with a combined purse of $21 million in 2008. In 2008, the Breeders' Cup Marathon was added but was dropped in April 2014. 2008 also marked the first time most of the races were run on an artificial surface, instead of the traditional dirt. On August 11, 2009 the Breeders' Cup announced that it would use the standard colored saddle towel system starting with the 2009 event. The new color-coded system (which has been used at many North American racetracks since the mid-1990s) replaces the standard purple saddle towels which had been used since 1985. The first Breeders' Cup in 1984 used yellow saddle towels. On October 22, 2009, the Breeders' Cup announced it had signed simulcasting and licensing agreements with Betfair, a company which in turn had purchased the horse-racing network TVG in January of that year. The agreement brought in Betfair's customer base of over 2.5 million, many of whom had legal access to common-pool betting. Betfair handled common-pool wagering at the organization's November 2009 championships, also streaming the events live to both national and international wagerers for the first time. At that point, the World Championship event was being telecast in over 140 countries, through various networks. Breeders' Cup also introduced the Breeders' Cup Challenge "Win and You're In" qualifying system, a policy wherein winners of major races throughout the year, from North America, England, Ireland, France, Hong Kong, Japan, South Africa, Australia would gain automatic access to the Breeders' Cup Championships races. Profits for 2010 were the highest in the organization's history, with wagering (both pari-mutuel and non-pari-mutuel) in 2010 nearing $200 million, or $21 million more than the previous year. Over $23 million of the non-pari-mutuel was wagered over Betfair. In 2011, the organization appointed Craig R. Fravel as CEO and President, a role he continues to hold as of 2016. Also in 2011, the Juvenile Sprint was added, only to be dropped after the 2012 running. Organizers had originally planned to ban raceday use of the anti-bleeding medication furosemide (Lasix) for more consistency with European standards, but reversed the decision due to concerns from horsemen and many handicappers. From 2008 to 2014, the Breeders' Cup was held at either Churchill Downs or Santa Anita Park, both major tracks with a demonstrated record of success in hosting the event. In 2015 however, Keeneland was selected as the host track for the first time, in large part because of Lexington's position as the center of the North American thoroughbred breeding industry. Although concerns were raised over Keeneland's limited amount of permanent seating, the 2015 event was considered a success, with record Friday attendance and a sell-out on Saturday. 2015 marked the first time a Triple Crown had been won since the inception of the Breeders' Cup, and thus the first opportunity to win the so-called Grand Slam of Thoroughbred racing, consisting of the Triple Crown and Breeders' Cup Classic. American Pharoah completed the feat in a decisive wire to wire victory. In 2016, Santa Anita had the record upon hosting the Breeders' Cup for a record ninth time. The 2017 event was held at Del Mar for the first time. The 2018 event was held at Churchill Downs. For the 2018 event, the Friday card was known as "Future Stars Friday" and featured five races for two-year-olds, including the new Breeders' Cup Juvenile Turf Sprint. The Distaff moved back to the Saturday card. Additional Breeders' Cup changes arrived with the Breeders' Cup Future Wager, similar to the Kentucky Derby Future Wager, and the first time the Equestrian event which was intermingled with Breeders' Cup and Churchill Downs activities. A maximum of 14 starters are allowed in each of the Breeders' Cup Championships races (depending on track dimensions, some races such as the Turf Sprint or Dirt Mile may be limited to 12 starters). Breeders' Cup Limited has adopted a field selection system to select runners in the event fields are oversubscribed. Winners of the "Win and You're In" Breeders' Cup Challenge races automatically qualify. Other pre-entries are ranked by (1) a point system for graded stakes performance during the year, and (2) the judgment of a panel of racing experts. After pre-entries are taken approximately two weeks before the Breeders' Cup, the ranking determines eligibility in oversubscribed races. After pre-entry, any vacancies in the fields are filled by horses in order of panel preference. Through 2006, there were eight races on the Breeders' Cup card, all classified as Grade I races. In 2007, three races – the Dirt Mile, Filly and Mare Sprint, and Juvenile Turf – were added, all of them run the Friday before the remaining eight races. Three more new races – a Turf Sprint, Juvenile Filly Turf and Marathon – were added for 2008. A Juvenile Sprint was added for 2011. The championship races in 2009 (pictured) were the second year to have a day devoted to female horses. Since 2013, the gender on both days is mixed between races. The order of the races on the card has changed many times throughout the event's history, but the Turf and Classic are traditionally the last two races. The 2008 event was the first in which Day 1 of the event was dedicated to races for fillies and mares, with Day 2 featuring all other races. For 2009, the Marathon, open to runners of both sexes, was moved from Day 2 to be the opening race on Day 1, but all other races stayed on the day they had been run in 2008. In 2011, the Marathon was moved from Day 1 to Day 2, with the Juvenile Sprint becoming the first race overall (and also the only one on Day 1 open to males). The Marathon returned to Day 1 in 2012. Since 2013, the first day was no longer primarily devoted to races for fillies and mares, with the Dirt Mile and Juvenile Turf moving to Day 1 and the Filly & Mare Sprint and Filly & Mare Turf moving to Day 2. We restored the Ladies' Classic to its original name due to feedback from our loyal fans who have a strong affinity for the Distaff. In recognition of our 30th year, the Distaff has provided us with some of racing's most remarkable moments, personified by such outstanding thoroughbreds as Lady's Secret, Personal Ensign, Azeri, Zenyatta, and our two-time defending champion, Royal Delta. It is a fitting tribute to bring back the name Distaff to honor the rich history of the championships. From 2008 to 2012, this race was known as the Ladies' Classic. As of 2018, favorites have won 99 of 318 Breeders' Cup races, a 33 percent strike rate. Of the 318 favorites, 59 were odds-on choices with 26 of them winning. The biggest longshot to win a Breeders' Cup race was Arcangues at 133.60-1. The oldest horse to win a Breeders' Cup race is Calidoscopio, age 9, who won the Breeders' Cup Marathon in 2012. The 1988 Breeders' Cup marked the first time a woman jockey competed, as American Julie Krone rode in three races that day; the Juvenile Fillies, the Juvenile and the Classic finishing 2nd, 6th and 4th respectively. Krone also became the first woman to win when she guided Halfbridled to a historic victory in the 2003 edition of the Juvenile Fillies. Rosie Napravnik became the second woman jockey to win a Breeders' Cup race, winning the Juvenile in 2012 on Shanghai Bobby and the Distaff in 2014 on Untapable. Six women trainers have won Breeders' Cup races, the first in 1996 when Jenine Sahadi won the Breeders' Cup Sprint with Lit de Justice. In 2009, Carla Gaines also won the Sprint with Dancing in Silks  and in 2013 Kathy Ritvo became the first woman to train a Classic winner, Mucho Macho Man. Most recently, Maria Borell saddled 2015 Sprint winner Runhappy. NBC broadcast the Breeders' Cup from its inception in 1984 through 2005. In 2006, ESPN took over the television contract for eight years through 2013. However, in January 2012 the Breeders' Cup announced a new contract with NBC Sports, superseding the final two years of the ESPN contract. Beginning in 2012, the Breeders' Cup would be broadcast in its entirety on NBCSN, except for the Classic which would be televised by NBC. In 2014, NBC announced a 10-year extension of their media rights to the Breeders' Cup. In 2015, NBC Sports announced a 3-year extension of their partnership to broadcast events from the Breeders' Cup Challenge series. The Breeders' Cup races were called by Tom Durkin from 1984 through 2005, and by Trevor Denman from 2006 to 2012. The Breeders' Cup has used two announcers in recent years, with Larry Collmus calling the races for the network shows, and the host track's announcer calling for the regular in-house and simulcast feeds. The Breeders' Cup is held at different racetracks. In 2016, Santa Anita hosted the event for a record ninth time. Churchill Downs tied this record when hosting the 2018 renewal. 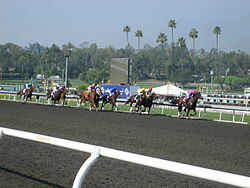 Belmont Park hosted the series four times, and Gulfstream Park and Hollywood Park each hosted the meet three times. For several years, the "Grand National Steeplechase" (now run as the Grand National Hurdle Stakes) was known as the Breeders' Cup Grand National Steeplechase under a licensing agreement between the National Steeplechase Association and Breeders' Cup. However, the Grand National was never an official part of the Breeders' Cup series. ^ "Nearly $160 Million Wagered On 2016 Breeders' Cup; Record Attendance Reported". paulickreport.com. Retrieved November 19, 2016. 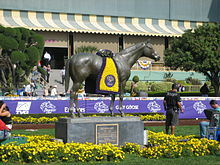 ^ "The 2007 Breeders' Cup". breederscup.com. Retrieved May 26, 2016. ^ a b "How it Works". breederscup.com. Retrieved May 26, 2016. ^ "Purses Increased for 2016 BC Classic, Turf". BloodHorse.com. Retrieved 2016-06-13. ^ "Breeders' Cup Championships Adds Juvenile Turf Sprint". BloodHorse.com. Retrieved 6 February 2018. ^ Paulick Report Staff (January 16, 2016). "Eclipse Awards Night at Gulfstream Park". paulickreport.com. Retrieved May 26, 2016. ^ "The World's Top 100 G1 Races for 3yo's and upwards" (PDF). www.ifhaonline.org. International Federation of Horseracing Authorities. Retrieved 3 March 2015. ^ a b c Duckworth, Amanda (October 30, 2013). "Oh, Breeders' Cup". ESPN.com. Retrieved November 3, 2013. ^ "Breeding & Nominations". www.breederscup.com. Retrieved 13 April 2018. ^ "Q & A With Greg Avioli, New Interim CEO of Breeders' Cup and NTRA". The Blood-Horse. June 9, 2006. Retrieved 2014-11-10. ^ "Catching Up With Breeders' Cup President & CEO Greg Avioli". Sports Business Journal. October 26, 2007. Retrieved 2014-11-10. ^ "Avioli Named President, CEO of Breeders' Cup". bloodhorse.com. Retrieved 1 July 2016. ^ a b Kerrison, Ray (October 20, 2008). "25 Years Later, Cup A Bonanza". New York Post. Retrieved 2014-11-10. ^ Hegarty, Matt (April 25, 2014). "Breeders' Cup eliminates BC Marathon". drf.com. Retrieved May 26, 2016. ^ "Breeders' Cup to adopt standard colored saddle towels for World Championships (includes picture of new towels)". Breeders' Cup. breederscup.com. August 11, 2009. Retrieved 2009-08-14. ^ a b c "Press Release: Breeders' Cup and Betfair Reach Landmark Wagering Agreement". Standard Bred Canada. Breeders' Cup / Betfair. October 22, 2009. Retrieved 2014-11-20. ^ Wood, Greg (October 22, 2009). "British punters gain new 'gateway' to Breeders' Cup betting pools". The Guardian. Retrieved 2014-11-20. ^ "BC Challenge Series Adds Four British Races". bloodhorse.com. Retrieved 1 July 2016. ^ LaMarra, Tom (November 9, 2010). "Breeders' Cup Bucks Trend With Handle Growth". The Blood-Horse. Retrieved 2014-11-30. ^ Paulick, Ray (September 28, 2011). "Breeders' Cup CEO Craig Fravel". paulickreport.com. Retrieved May 26, 2016. ^ "Statement from Breeders' Cup President and CEO". breederscup.com. April 7, 2016. Retrieved May 26, 2016. ^ a b "Breeders' Cup will not expand Lasix ban, drops Juvenile Sprint". Daily Racing Form. March 1, 2013. Retrieved October 24, 2013. ^ "Breeders' Cup 2015". keeneland.com. Retrieved May 26, 2016. ^ Paulick, Ray (June 24, 2014). "Despite differences, Breeders' Cup at Keeneland will shine". Retrieved May 26, 2014. ^ Lintner, Jonathan (November 2, 2015). "Breeders' Cup 2015 - Record Keeneland Crowds". courier-journal.com. Retrieved May 26, 2016. ^ Bieler, Des (October 31, 2015). "Watch American Pharoah win horse racing's first ever grand slam". Washington Post. Retrieved May 26, 2016. ^ "Breeders' Cup - October 30 & 31, 2015". breederscup.com. Retrieved August 29, 2015. ^ "Breeders' Cup Friday to Spotlight Juvenile Races". BloodHorse.com. Retrieved 4 July 2018. ^ Staff, Brisnet (2018-08-22). "First of three 2018 Breeders' Cup Future Wager pools features Classic, Distaff". Brisnet. Retrieved 2018-10-26. ^ "Future Pool Wager | Breeders' Cup". www.breederscup.com. Retrieved 2018-10-26. ^ "Future Wager on Kentucky Derby". www.kentuckyderby.com. Retrieved 2018-10-26. ^ "HOME". EQUESTRICON. Retrieved 2018-10-26. ^ "All Articles - BloodHorse.com". bloodhorse.com. Archived from the original on July 10, 2012. Retrieved August 29, 2015. ^ "Breeders' Cup Juvenile Turf Sprint added to World Championship Program". Breeders Cup Ltd. Breeders Cup Ltd. Retrieved 6 February 2018. ^ "Leading Breeders' Cup jockeys". Breeders' Cup. Retrieved November 6, 2018. ^ "Leading Breeders Cup Trainers". stats.breederscup.com. Retrieved November 6, 2018. ^ "Leading Breeders Cup Owners by Money Won". stats.breederscup.com. Retrieved November 6, 2018. ^ "Leading Breeders' Cup Breeders by Money Won". stats.breederscup.com. Retrieved November 6, 2018. ^ "Leading Breeders Cup Winners by Money Earned". stats.breederscup.com. Retrieved November 6, 2018. ^ "Leading Breeders' Cup Sires by Money Won". stats.breederscup.com. Retrieved November 6, 2018. ^ "Leading Breeders' Cup Dams by Money Won". stats.breederscup.com. Retrieved November 6, 2018. ^ "Returning Winners". stats.breederscup.com. Retrieved February 6, 2018. ^ a b "Records". stats.breederscup.com. Retrieved November 6, 2018. ^ "Countries that produced Breeders' Cup winners". stats.breederscup.com. Retrieved November 6, 2018. ^ Shulman, Lenny (January 22, 2012). "NBC Takes Over Breeders' Cup Coverage". The BloodHorse. Retrieved January 22, 2012. ^ "Breeders' Cup and NBC Sports Group reach unprecedented 10-year media rights extension". Retrieved May 26, 2016. ^ "Breeders' Cup and NBC Sports Group announce multi-year renewal". Retrieved May 26, 2016. ^ Los Angeles Times (June 19, 2014). "Breeders' Cup is coming to Del Mar in 2017". latimes.com. Retrieved August 29, 2015. ^ "2013 Breeders' Cup back to Santa Anita". ESPN.com. Retrieved August 29, 2015. Wikimedia Commons has media related to Breeders' Cup. This page was last edited on 26 March 2019, at 02:49 (UTC).